The good news is that the carport addition has been scheduled! They’re supposed to begin work in two days (on the 18th), weather permitting. I’m so exciting about getting this done now. It was totally out of the blue, and had my neighbors not had their covered patio built now, I probably never would have even thought to do the carport now. But they did, so we are, and things will work out so much better in the back portion of the studio (i.e., the mudroom and half bath) as a result. So what’s the bad news? The cost. Ours is going to cost quite a bit more than the price that this builder gave the neighbors for the basic structure. I was disappointed, but I also completely understand why there’s such a difference in price. First, ours is a carport and not a covered patio. That means that the concrete has to be poured in such a way to support the weight of vehicles, and not just the weight of humans walking around and sitting in outdoor chairs. After the whole flat roof structure over the mudroom and half bath are removed, the walls will be reframed so that they’re actually a full eight feet high (as opposed to the current 7-foot height), and then the carport roof will be tied into the original roof over the actual studio. So naturally, all of that additional demolition and reframing adds quite a bit to the cost. Also adding to the cost is the inclusion of a wheelchair ramp for Matt, but oh my goodness, that will be worth every single penny! I can’t even express to you how nice that will be to have an actual, usable, safe wheelchair ramp. 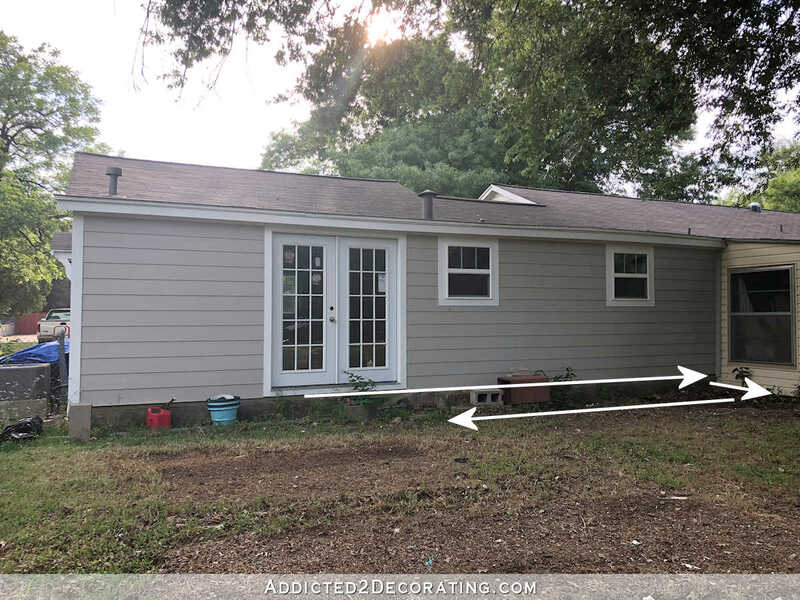 From the back door, it will run along the side of the house and go towards the sunroom, then it will U-turn and come back and tie in to the carport. I know many of you were shocked when I decided to remove the ramp from the front porch, and several of you urged me to keep it. But y’all, that thing was more dangerous than it was usable simply because it was so steep. An ADA-compliant ramp is supposed to have a vertical rise of no more than one inch for every 12 inches of ramp length. The front ramp had a vertical rise of about two inches per foot, and it dead-ended into grass, weeds, and gravel. There’s no way Matt could have ever gotten up or down that ramp by himself, and if he tried, he probably would have lost his grip, rolled down the steep incline, and ended up on the ground. It was a scary ramp, not a helpful ramp. But the new ramp will have a 1/2-inch vertical incline every foot of ramp length. That will be amazing! And the final added cost has to do with the actual framing upgrades needed since ours will be a carport. My neighbor had additional support columns added to the design of his covered patio. He liked it like that for aesthetic reasons, but those additional supports also made the cost of the structure less because the builder was able to create the horizontal support beams (i.e, the beams that sit on top of the vertical columns, and on which the entire roof rests) out of regular lumber. But since mine is a carport, I want as few columns as possible (I don’t want to have to dodge columns as I’m pulling vehicles in and out), so horizontal support beams made out of regular lumber are out of the question seeing that these beams have to span 24 feet on the two long sides (i.e., the side where I’ll be pulling vehicles in and out), and 20 feet on the gable end. For mine, the builder will have to use 3-ply LVL beams that are 5.25 inches thick, 16 inches high, and 24 feet long (or 20 feet long for the gable end). Those LVL beams can get quite expensive. So with all of these additional costs, what’s the final price? $14,860. Yep, I can hear a whole lot of you gasping right now, and the funny thing is, those collective gasps probably have some wildly different thoughts behind them. Do keep in mind that Matt and I bought this house (sitting on one acre of land in the city) for $80,000. And we specifically bought a cheap fixer upper, as opposed to a completely finished $250,000+ house, because we wanted to be able to customize it over time (paying cash as we go so that we don’t end up paying triple the cost in interest to a mortgage company over the span of a 30-year mortgage) and make it our own. The concrete pad plus the ramp is $4,839. This includes the excavation/grading of the land, the forms, the concrete, steel rebar, perimeter beams, an interior beam, concrete bells poured under each column, and a broom finish for a 20 x 24 carport. The roof sheathing and roofing is $3,213. This includes the OSB sheathing, clips, felt paper, shingles. It also includes some pretty significant flashing that will have to be added where the new carport roof meets the flat roof that will remain over the pantry, which may result in them having to completely re-roof the pantry as well. That’s the breakdown of the project costs. Add to that the 16% for profit and overhead, and that brings us to our final number. He gave me the option of just paying him for labor only, in which case I could save the 16%. But that would also mean that my time would be spend sourcing and purchasing materials, arranging for delivery to the house, etc. Ummm…when we’re dealing with project materials that include 3-ply 24-foot and 20-foot LVL beams, no thanks. Paying someone else to manage all of that stuff, and to be sure that all of the materials arrive on site when needed, is well worth the additional cost to me. So let’s all pray for good weather, because I really want to see things get underway on the scheduled start date! He has scheduled four weeks for completion, but we’ll need consistently good weather for that to happen. Yikes! This is exciting. I’ll keep my fingers crossed for your weather. I’m so glad they are starting so soon. It will all make your life a lot easier in the near future. Sounds like a bargain to me. Hard to believe you paid $80 thousand for it, in California you couldn’t buy a shed for that! Yea for Texas is right. Congrats on getting it done! Praying for good weather. Not in proper Atlanta either! I love the idea of the safer ramp for Matt! I love reading your blog and get excited when I see you have posted something. You have certainly been blessed with many talents. Thank you for sharing with us! YES !!! Matt needs the ramp and it’s wonderful that you will be able to incorporate a wonderful, safe ramp into this project now and you all don’t have to wait any longer. Will certainly pray for good weather for you all. I love following you and Matt as you make this home work for the 2 of you….and your pets. This is exciting !!! LOL! Put me down in the category of “gasp’ers” shocked at how inexpensively you can get things done in Texas. Will continue to live vicariously through you! I’m in the same “gasper’s” camp! Is there a reason you not just going ahead and replacing the entire flat roof now? Is it schedule to be done when you re-do the sun room? Thanks for the breakdown of costs–very helpful!!! The flat roof above the sunroom will be torn down and replaced with a regular pitched roof when we do the addition. 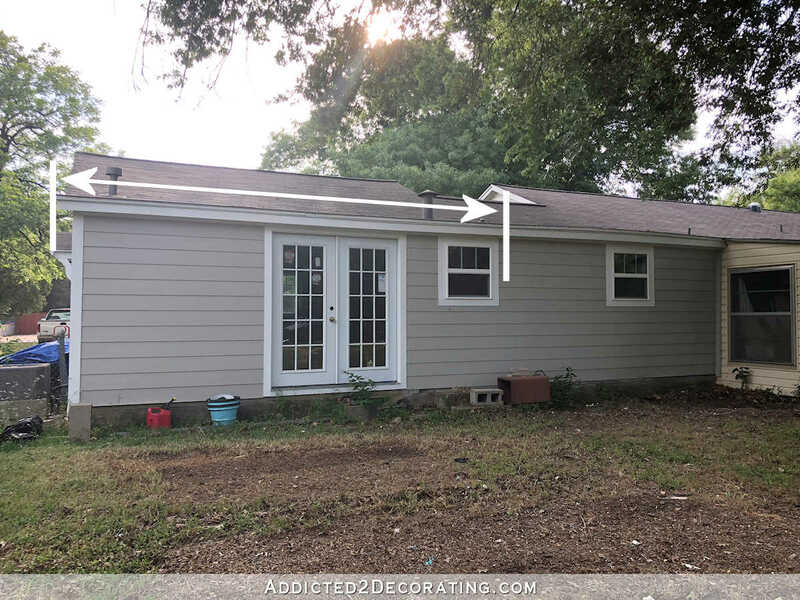 The only flat roof that will remain after the carport and the family room/utility room/bedroom addition is done will be the 12-foot section above the pantry, and that part will probably get re-shingled during the carport addition. Congrats! It’s going to be awesome! How is Matt getting into the house currently if there’s no ramp on the front OR back? This is my first ever hired-out large project like this and I really have no idea what to expect. I know what the materials would cost me to buy myself (probably way less than $2000), but I have no idea what a contractor would charge for the same work and materials. He could come back at $5,000 or $20,000. 😉 I do know that if it comes in over $10k, it’s way out of our league. I’m fully expecting to have to dial him back to basically framing it out and roofing it and then I’ll do the screening panels, doors, and finishes myself. Though it’d be so very nice to just have it all done for me and move-in and enjoy the space for the summer. Justin – our builder built ours with knee walls and openings just like a framed window opening. He then bought screens that were designed for windows, and just screwed them in the openings with sheet metal screws. Easy, peasey! He also put outdoor outlets all around the porch inside (too many for me!) so we could, if we want, have lights anywhere. It looks really great, and we love it! The ceiling fan lets us be out there most of the time. If you wanted a full view without the knee walls, you could use patio door screens the same way. That’s so nice and exciting! Your kidding! I might have to move to Texas! Seems so inexpensive! I got a quote to paint my house for that price!😕. I live in Texas and I think that’s a great price. I can’t wait to see how it all turns out. Once we get our house finished we will want a carport too so I’m excited this is a project you are doing too so I can watch the progress. Hoping for great weather for you. Um, yeah. That is crazy cheap. In urban Florida it would be at least double, if not triple the cost. Yay for Texas! How exciting! The price sounds fantastic, Kristi. That new ramp will bring independence and peace of mind for you and Matt; so glad it’s part of the package. Yes, that’s a pretty good price for carport, slab and ramp! I’m so glad you are going for the safer ramp design. It’s going to be great! Actually, that cost does not sound high for what you are getting. It sounds really reasonable in fact. Yay! I’m so excited for you!! Will pray for good weather too 🙂 I know you’ll be so thrilled to have that done! I was guessing it would cost a lot more. You will benefit in so many ways. I look forward to photos. I don’t think the cost is too bad considering all the work that needs to be done. Good luck with project. Do you need a new roof on the remainder of your house? It will you in he next few years? Would it make sense to do the entire roof now so that it all matches and wears at the same rate? I ask because I recently replaced my roof and had to make those same considerations. For me it made sense to replace the entire roof all at once. *if not, will you need a new roof in the next few years. The roof is only four-and-a-half years old, so it doesn’t need replacing yet. Sounds cheap to me! Can’t wait to see the end result. Hi Kristi, I’ve never followed a blog before and I’m loving yours. We moved to GA 2 years ago and I have so many dreams for my home. I’ve been decorating my homes for many years (I’m 79) and it’s my absolute favorite hobby. Just last week I sanded the finish off of a coffee table I bought in 2003. I wanted one of those train station luggage cart replicas that were popular then. I couldn’t afford the more authentic ones so I bought this one with a brown stain on Wayfair for 250. It was fine for the time but I recently got a brown suede couch and I have a brown leather chair so the brown was too much. I borrowed a big sander from my neighbor and spent 2 back wrenching days getting that finish off. I just love it now, wish I could show you a picture. By the way I’ve been in a wheelchair for 10 years due to degenerative spine disease. I’d love to know more about Matt, there are so many unique problems to wheelchair living. Thanks for brightening my world. God bless you both! My husband and I are musicians. We had a Country band in FL and then we became Christians and started writing music. We had a great life, traveling around the states and overseas performing our music. We did it into our 60s until it became too difficult. Now Charlie plays bass in our church band and I root from the audience. We also love pets (a beagle and a mutt as well as 4 kitties) and we love to laugh too. He likes my decorating although he’d be happy in a shack i think. I’m so glad I found your blog, it keeps me thinking. I couldn’t do many of the things you do but you inspire me to try more. I will also be watching with interest. This price sounds quite reasonable to me, as I live in Birmingham, AL and the cost of living here is more in line with Texas. When our back neighbors very unceremoniously cut down all the trees which gave us shade and privacy but were unfortunately on their side of the fence, our backyard was the saddest thing you have ever seen. We built a 30′ long 12′ high pergola (now covered in flowering vines of various kinds) and a screen porch. The porch was about 15K and the pergola was about 8K. The yard was then planted out in fast growing trees and shrubs. The husband did all that, as well as all the hardscaping of patio pavers and paths, etc., himself, so I don’t know what that part cost. In the overall scheme of things, the cost becomes the least important thing on the checklist. Safety for your husband, privacy and security with the good construction and roofing have to come first. This will be so nice for you and Matt. I am so happy for you . It will make things so much easier for you both.I think it will look really nice . Wonderful! I was wondering, would cedar posts [no cladding necessary] for your carport be much more expensive. Just thinking Tx aesthetics, and I love cedar! [Both beams and posts] Might not be your thing, but love that look, with a stone patio. That price is great! I’ll pray for dry weather for you! Have you noticed any price increases on building supplies since the hurricanes? We in Mo. always seem to see an increase when there’s a natural disaster. And the quality isn’t good either. After about 6-9 mos. the prices slowly go down, and supply is more plentiful too. I haven’t necessarily noticed it since the hurricanes, but I’ve definitely noticed an overall increase in general. The price of lumber in general just seems to be slowly but surely creeping up and up and up. Congrats! It will change the way you both enjoy your home! From my perspective here in Canada you have a steal of a deal! My upper deck materials alone cost $6500. (when the dollar was on par lol) with deep discounts! You must be able to get permits a whole lot faster in Waco than anywhere I’ve lived! Praying for dry weather and a stress free build for you. You may have talked about why a carport makes more sense to your personal needs as opposed to garage in another post. I can tell you are someone who thinks about all angles and come to a decision after much thought so I’m sure I’m not bringing up anything new. Although car ports are less expensive than a garage in my home state of FL garages are usually safer to store things in than a carport and add one more door to get through for someone who wants to break-in to your home. Garages are also more desirable for re-sale. I’m curious as to how much more expensive a garage would be than a carport b/c it seems like the cost for a carport is at least 2/3 of the way to a garage. Although $14K+ is a lot of money, it sounds like you’re getting a lot of bang for the buck. We were quoted almost $2.5K just for a 10×12 patio, so the cement costs seem very reasonable. Sounds like a great plan. Very good price but I’m in California, although I live in the Central Valley which is reasonable compared to the rest of the state. Enjoying seeing and hearing about all your projects. Happy Matt will have a nice ramp too. Really enjoy following your blog. Lots of neat things you are doing. Kristi, honestly that price is not bad at all. I was expecting it to be twice that, but I’m in southern California (west L.A.) where *everything* is vastly overpriced. You’re getting a lot of work done for that price including structural work on part of the house itself. Heck, I’m about to pay a mechanic about $2,500 for shocks/struts, brakes, and new tires for my car, and it’s just an old Toyota, so less than $15,000 for that kind of work on your home seems quite reasonable to me! You poor thing, lol. My husband does all that himself (except tires), as he’s happier working on a car than most anything! Having a family member who is “chair dependent” presents some real challenges. ANY amount spent to allow a person to enter and exit their home, under their own power, is well worth it. I’m thinking, what a truly awesome deal! We just had a covered patio put on the back of our house here in California (not as large as your planned car port, but did involve the removal of a fireplace + chimney, and some minor modification to the existing house roof and the doorway leading out to patio. But the concrete floor already existed, so minimal new concrete involvement — so probably less over all effort and materials than what your car port involves.) That patio cost us about 4 times what you will pay for your construction! I think this is an excellent price for what you need to have done. First, safety and convenience for Matt, of course, should be a top priority. And fixing that low ceiling makes tremendous sense for future aesthetics and function of interior spaces. And creating a new configuration that is not an eyesore as so many cheaply done ramps are is a huge plus! Kristi, I’m so happy you are having this built right the first time. Any contractor could have put you up an in-adequate shed for a carport. I’ll be so happy for Matt, and for you, when it’s done. When I saw the price I thought that was for the pour only. It makes a whole lot more sense now that you’re bringing in having them put up the carport structure, take roof off, install a new roof with new roof lines to connect the carport to the house, tie everything together, and ensure that the underlayment of the carport is adequate to the weight it needs to bear. You’re paying them to install something that should last for decades and save you a whole lot of labour and time. When that is considered the price is quite reasonable.